Can I Use Cast Iron on a Glass Top Range? I often have people email me asking if it’s okay to use cast iron with glass top ranges. 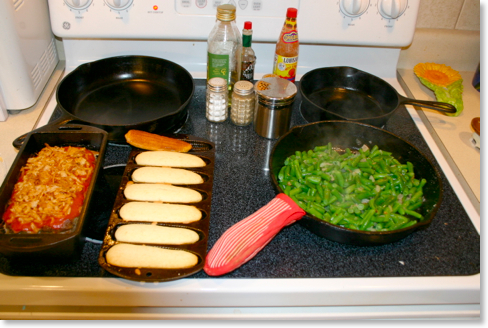 Some range manufacturers include warnings against using cast iron with their products. And the RangeKleen fryer we reviewed last year had a warning against its use on a glass surface. Of course, we ignored that, and I’ll tell you why below. What’s the big deal about cast iron and glass (or even ceramic) surfaces? Well, glass can get scratched. We live in such an over-protective culture that we often throw the baby out with the bath water when it comes when it comes to erring on the side of judgment. For instance, many schools have gotten rid of playground equipment because some children might get hurt on it. I got hurt on playground equipment when I was a kid, but I promise you, I’d rather have had it than to not have it. Ladder companies tell us not to use that top step as a step because some people have been reckless enough to do it and have gotten hurt. I wonder how long before you can’t buy a ladder. And just try finding a diving board for a backyard pool these days. You can find one, but it’s getting difficult. Anyway, companies that make glass top ranges don’t want you to call them up complaining about how easily their surfaces get scratched, so they simply tell you not to put anything heavy on it-- especially cast iron! By the way, the heaviness of cast iron could also cause your glass top range to break if you dropped a pan, so this is another concern with the company. Now, I don’t want you to call me up complaining about your scratched or broken range top either, but I can tell you that IF (this is a big if) you are careful, you can use a glass top range or stovetop with no problems. In fact, if you notice in most of my pictures, such as the one above, Kathy and I have a glass range right now. In reality, I much prefer a gas range, but this is just where we live right now and we’ve made do. I can tell you that we use cast iron all the time on our glass top range. Cast iron works great on a glass top range. In fact because a glass range heats evenly and cast iron heats evenly, it’s a pretty good match. I would even guess that today, gas ranges are probably in the minority for most kitchens even though most of us who really “get into” cooking prefer them. If you have a glass top range, let me offer a few suggestions for keeping it unscratched (and unbroken!) and in tip-top shape. Keep you range top CLEAN. Usually what scratches your range top is some kind of abrasive substance between the surface and your pan. Also, make certain that your cleaner is specifically designed for the range you have. Usually the manufacturer recommends specific cleaners. If yours doesn’t, check on the label of the product you are buying. Glass range cleaners can usually be found at appliance stores, home improvement stores, discount stores and more. By the same token, keep the bottom of your pan clean. If you’ve got gunk building up on the bottom of that pan, know that it can damage a smooth surface range. Set cast iron down gently onto your smooth-top cooking surface. If you’ve ever been burned by a pan coming out of a 400° oven, you know how easy it is to simply drop it on the floor or your range top. Use both hands and use pot holders that are thick enough. I’ve learned the hard way that those little mitts that fit over the the skillet handle is not enough protection for a pan that has been in a hot oven for any period of time. I also feel that the short handle on newer skillets across from the regular handle is genius. This really helps the cook use both hands when handling a hot skillet. By the way, I ran a quick survey of our panelists in regard to what kind of range they use. JT and Pat use a gas range, but Kathy and I as well as Leila have a smooth top electric range. One great aspect of cast iron is that it is so versatile it can be used with just about any kind of heating source--open flame or flat glass or even coals from the campfire.